I have been wanting forever to get a picture of a Wood Duck. This morning I took my camera to the pond to capture my annual picture of the Hooded Merganser but the light was horrible as the sun was on the horizon blinding me most of the time. I found some ducks across the pond in a shaded area. I finally looked at them this afternoon. Not sure but think it they are Wood Ducks. Anyone want to venture an opinion. If it is I am thrilled. Needless to say I will be going back. But they could just be passing through. @vignouise look what I found. 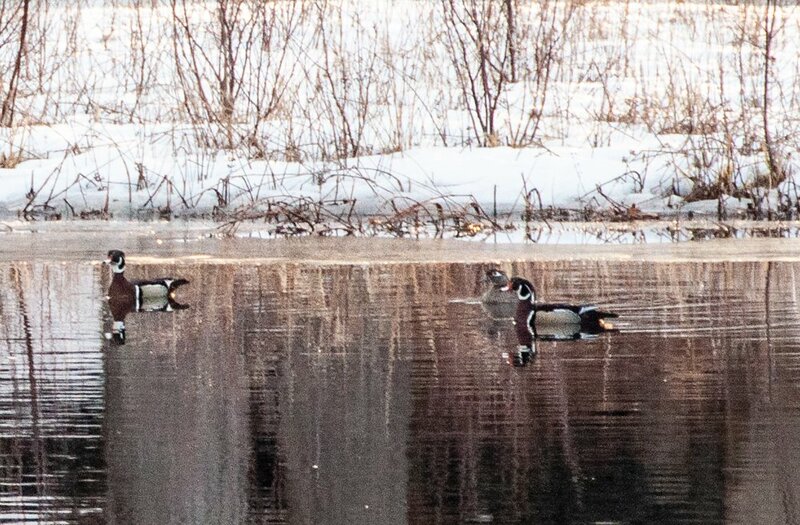 They sure look like wood ducks, great capture! Sure looks like Wood Ducks to me. Good shot! Not heard of Wood ducks, but a good shot. Interesting ducks. Isn't it funny the way names are used in different places - these are spectacular looking ducks - our wood ducks are very dull and boring. Yes, wood ducks. I used to tell my students you could identify wood ducks easily because it looks like they are wearing a baseball cap backwards - like many of my students did! The one on the far right of your image shows it most clearly but if you google wood ducks you could find a close-up image. Nice find, Joan! @365karly1 Thanks but because of the lighting I didn't pick up all the colors so I wasn't sure. Well done to capture them Joan. I hope they are still around so you can get another shot. A stunning capture with wonderful tones and reflections, fav! @tdaug80 I am droppong out of get-pushed because of time constraints, I will do this week if you do something simplier for me. @joansmor Try this one: Take 10 unique photos of one small object. Post your favorite. @tdaug80 Ok that is cool and I can do it.